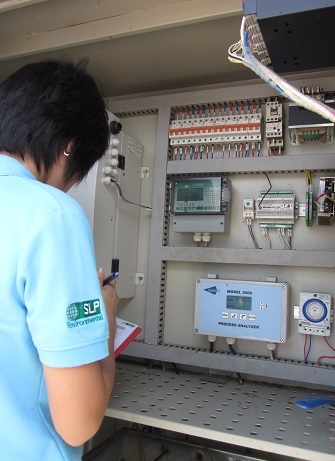 SLP Environmental (SLP) has been offering Environmental, Health and Safety (EHS) Compliance Auditing services, including the preparation of bespoke EHS Legal Registers (EHS LR) for our client’s operations, across most ASEAN jurisdictions for over ten years and is now pleased to launch the service in Myanmar. SLP’s specialists have spent the last year developing a comprehensive in-house database of the existing and upcoming legislation and statutory guidance pertaining to EHS performance in Myanmar and can now offer our clients a tailored EHS LR which is aligned with their specific activities. The preparation of a bespoke EHS LR is a staged process. During Stage 1, SLP will formulate and issue a Questionnaire for the facilities management to complete prior to the Stage 2 Site Visit. During Stage 2, SLP will send a specialist EHS auditor(s) to the facility under assessment to conduct a guided site familiarisation tour. The primary objective of this workstage is to provide our specialists with a detailed understanding of your operations and associated activities, which is essential to the preparation of a bespoke register. During the site tour our auditors will generally follow the flow of the production process and target specific areas of the facility for inspection such as chemical stores, wastewater treatment plants, waste storage areas etc. During Stage 3 our EHS specialists will prepare the Environmental Health and Safety Legal Register (EHS LR) for the facility. The EHS LR is prepared in spreadsheet type format organised by Theme and Sub-Theme and includes the Legal Citation, the Key Requirements associated with each citation, Related Documents, Guidance Notes and an Annex containing the applicable laws and regulations in full. A generic example is provided in the extract below. 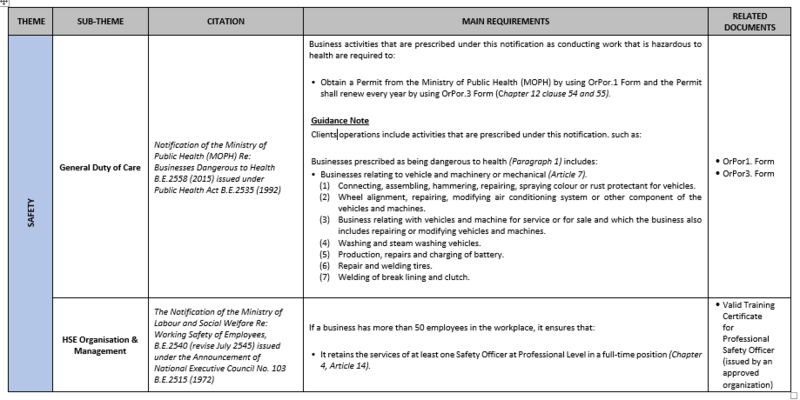 The Myanmar Government will shortly be enacting a new and comprehensive Occupational Health and Safety Law which will apply to businesses operating in multiple sectors throughout Myanmar. Once enacted the business activities prescribed under the law will have a limited timeframe in which to become compliant with the requirements of the new law or potentially face enforcement action. From a good practice and corporate social responsibility perspective, compliance with national Environmental, Health & Safety (EHS) regulatory requirements is a critical part of the risk and liability management process associated with assessing, maintaining and improving EHS performance. Our team of EHS specialists can also provide a comprehensive EHS Legal Compliance Auditing service. SLP will prepare and issue an EHS documentation preparation list in advance of conducting the onsite audit to enable the facilities EHS Management team to prepare the documentation requiring auditor review during the audit. SLP specialist auditors will then conduct the Regulatory Compliance Audit at the facility under assessment and a typical itinerary would include opening meetings and presentations followed by an orientation tour of the facility to help SLP’s auditors become familiar with the layout of the facility and to identify areas of the facility which will require further detailed examination. A review of the facility’s environmental health and safety compliance documentation and further targeted inspections of selected areas and activities to spot check H&S procedures (if required) will also be undertaken. Summary findings would be presented onsite during an Audit Wrap Up and Close Out Presentation to Facility Management. Following completion of the onsite audit SLP will report the findings of the EHS audit in a simple spreadsheet type format accompanied by a narrative findings report. Each finding will be categorised based on risk assessment techniques in order to prioritise actions, root causes will be identified and corrective actions recommended to close out the findings. The report will also include a timeline for implementation and assignment of responsibility for implementing actions. SLP Environmental is an award winning ASEAN consulting company specialising in the provision of high quality environmental, social, health, safety and risk management consulting and advisory services throughout South East Asia. SLP Environmental has a proven track record providing high quality EHS compliance auditing services for a diverse client base across a range of sectors including; automotive, chemicals, commodities, electronics, energy, heavy industry, manufacturing and pharmaceuticals. SLP Environmental has provided EHS Compliance Auditing and EHS Legal Register services for many of the world’s largest companies including General Electric, Mitsubishi, Novartis, Johnson Controls, Mars Inc and Reckitt Benckiser and can provide client testimonials on request. SLP Environmental also provide this service across the ASEAN region and we have up to date, in-house EHS regulatory databases for Cambodia, Indonesia, Laos, Malaysia, Myanmar, Philippines, Singapore, Thailand and Vietnam. Please feel free to contact us at info@slpenvironmental.com without any obligation to discuss your requirements.